Bebbington is a major talent and one to be cherished. He is one of those pianists who can transcend the essentially percussive nature of the instrument. This quality stands him in good stead in much of the English repertoire and especially in Ireland and Bridge. 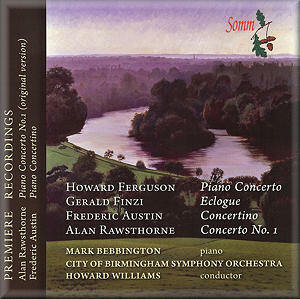 The 25 minute Ferguson concerto is here recorded for its third time. The earlier issues were for EMI Classics (Howard Shelley) and then for Naxos (Peter Donohoe). No one matches this coupling. Bebbington brings his deep satin to music that variously recalls his good friend Gerald Finzi and a figure I had not looked to hear as an influence: Miaskovsky. It's strange how strong the string writing resembles the Russian in such works as his Sinfonietta and Serenade. There's a delight unchained too in the chiming and skipping Allegro giovale. Its exuberance, recalls the best of the Russian divertimento concertos such as those by Kabalevsky and Shostakovich. Bebbington's touch, caught between silence and sound, is ideal for the calming numbers of Finzi's Eclogue which I am delighted to say has the centred quality and confidence to find an unhurried rate of unfurling. What's more the strings are ample in tone. Frederick Austin has seen a little renaissance on record, I am pleased to say (review). This Piano Concertino runs to no more than 13 minutes and three compact movements. Commissioned for some now unknown film by Ernest Irving for Ealing Studios, it survived only as a piano score. David Ellis furnished the orchestration. It is an interesting piece of romantica from around 1944. More power to Martin Lee-Browne who has done so much for the re-launch of Austin's music. This is not a scorchingly passionate score; rather it is lyrical and nostalgic in a way recalling Rachmaninov. It also rises to moments of grandeur. Bebbington relishes every twist and turn. He must have enjoyed the occasional similarities with the John Ireland style in the finale. After three romantic scores the Rawsthorne has more vituperation and vinegar. The spitfire Capriccio is in constant furious motion. The edginess is accentuated by the comparative asceticism of the string orchestra and percussion even if the xylophone does play the gaunt clown's skull. Even as early as the 1930s the quasi-fugal second subject is pure Rawsthorne at 3:30 in I. The central Chaconne is affecting but not what you would call very emotional. In fact while there is a degree of merriment it is all pretty dry-eyed. This is a comment on the music not a demerit in the playing. This is a first recording for the Rawsthorne in its original orchestral garb. Well worth encountering. It proves, if proof were needful, that Bebbington can also be completely at ease with more objective, witty, brittle and pianola-bright writing. A stimulating collection - not short on fascination. I am looking forward to Somm's impending release which will include the Ireland concerto and Bax's Concertino.